Many slighter older Notebook/Laptop computers have wireless cards inside them that transfer data at slow 802.11g speeds upto 54mbps. A quick and easy way to make network file transfers to/from these computers faster is to use a 802.11n Wireless N USB Adapter which has speeds upto 300mbps as well as increasing the distance you can use the wifi network away from the Wifi source. I tested the following 802.11n Wireless N USB Adapters which all connect to your Notebook/Laptop computer via a USB port: Linksys WUSB600N, Netcomm NP900N and Netgear WNDA3100 all connected to a Netgear WNDR3700 Dual Band Wireless-N Gigabit Router. 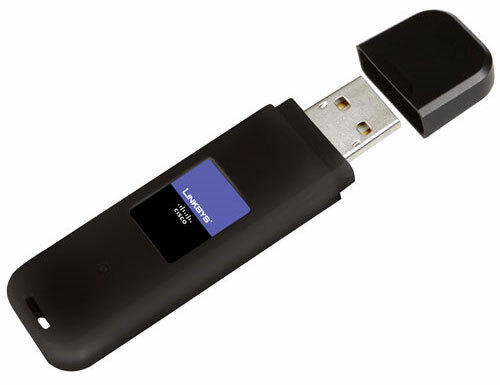 The more flexible Wireless N USB Adapters like the Linksys WUSB600N and Netgear WNDA3100 are able to connect to WiFi networks running at 2.4ghz and 5gHz which is handy in case you have access to WiFi networks at these 2 frequencies and one has a stronger signal. The WiFi signal travels farther and allows you to maintain a wireless connections much farther away than the old 802.11g standard – with Wireless N, the farther away you are, the more speed advantage you get. Check the box for specifications like 1T1R or 2T2R. 1T1R usb adapters will only connect at a max of 150M, whereas 2T2R and above will connect at 300M. For example the Netcomm NP900N is 1T2R so it can receive data at upto 300mbps and send at upto 150mbps. At time of writing the minimum costs for each Wireless N USB Adapter at Australian online stores not including delivery was: Netcomm NP900N ($48), Linksys WUSB600N ($70) and Netgear WNDA3100 ($85). Fastest Speed & Best At Long Distance: If you need speedy transfers regardless of whether you’ve got a strong or weak WiFi signal than the winner is clearly the Linksys WUSB600N which was fastest in every single test I did regardless of whether I was sending or receiving or the test was near the Wifi source or far away. Value for Money: While the Netcomm NP900N Wireless N USB Adapter was the slowest it is still clearly the best value for money. I picked up the linksys wireless N adapters when i upgraded to wireless N for my home network and the speed is awesome. I really notice it when i am streaming or downloading movies or tv shows. Someone buying this will likely have 11g stuff and 5GHz is going to be pretty useless and confuse them. The Netcomm cheap low end version tested has less internal aerials, they also have 901 and 902 higher end devices with the same number of aerials as the other two. I don’t own a linksys wireless N adapter but i have read reviews of it in digit magazine, and it’s value for money. Does the WUSB600N come with an extender base (so you can move the usb connection around) like the Dlink DWA-160? Don’t forget if you get the Linksys WUSB600N adapter and you are using windows 7 that you get the latest version driver (3.0.10.0) from linksys as it fixes a bug where the adapter disappears when it comes out of sleep. At time of writing, Windows Update only has the 3.0.9.0 driver available which has the bug in it. I’ve just ditched my wireless 54G adapter for a 300Mbps wireless N and the speed of my PC has almost doubled even though I’m only on a 6Mbps ADSL phone line? Wireless N is the future! Next PostNext How Big A Mortgage Is Too Big in Australia?